CINCINNATI -- The sweet smells of onion and garlic filled the kitchen of an old West End rectory on a recent Thursday evening. The housemates talked and laughed as they settled into mismatched chairs around a big, dining room table. They joked about the elbow macaroni that Lopez Adredano had to mix in with the spaghetti and the white sauce made from a mostly remembered Pinterest recipe. But before they filled their plates, they paused for grace. "Please bless those we served today," David Devlin said. "Please bless this food and the hands that prepared it." That’s right. A group of hungry 20-somethings bowed their heads in prayer without anyone there to cajole them into it. But these aren’t typical 20-somethings. 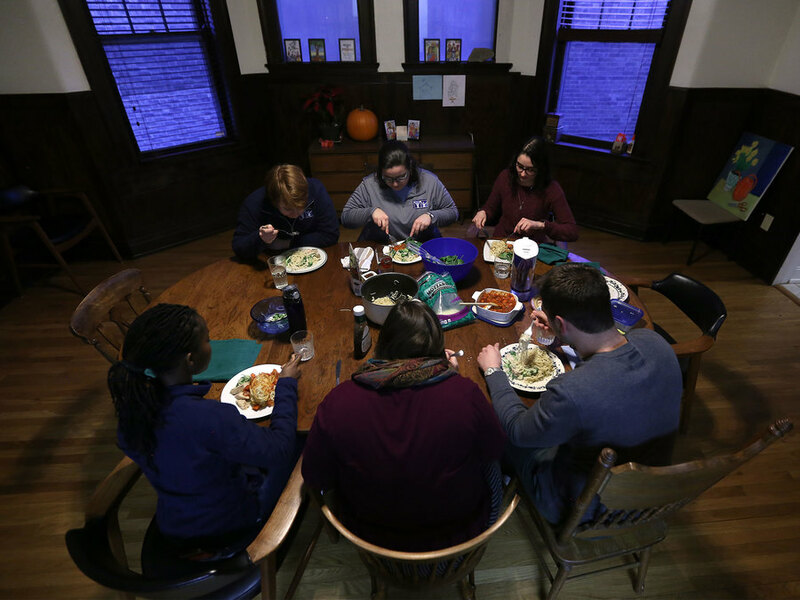 They are the Vincentian Volunteers of Cincinnati , young adults that devote 11 months of their lives to work at the Society of St. Vincent de Paul in Cincinnati and live in solidarity with the neighbors they serve. 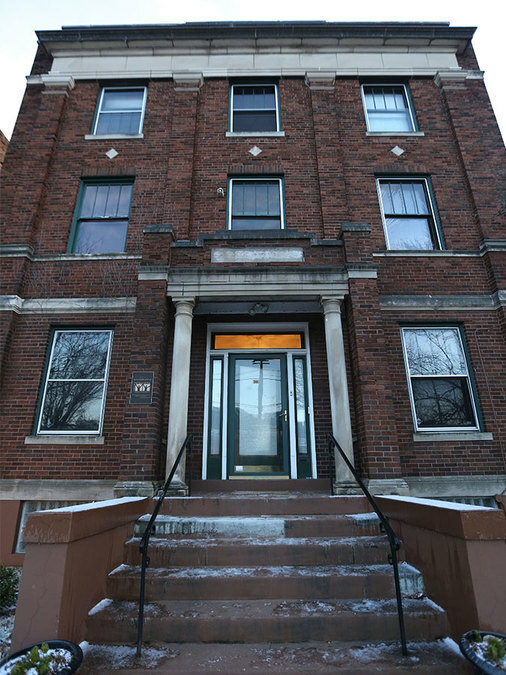 For the VVCs, as they’re known, that means living in an old rectory on Bank Street owned by St. Vincent de Paul, and earning a small monthly stipend. They will be eligible for a $5,800 educational award at the end of their service. But during their year as VVCs, they buy their groceries with food stamps and get around using the bus. It’s a modest life that helps them better understand the people who visit St. Vincent de Paul seeking help. It also helps them figure out what careers they want to pursue in nonprofit work or social services. It’s kind of like “Real World,” but with young people who care about improving people’s lives rather than being on TV. “It’s very counter-cultural,” Carpinello said. It doesn’t take long for them to feel changed. WCPO began following several of the VVCs in September of 2017 to chronicle their experiences. Here is what they have learned so far. Jack Delisio grew up in Westwood and went to St. Xavier High School. He started getting involved in service learning projects there and got more involved in college at Xavier University. But he wasn’t sure what he wanted to do after he graduated from Xavier with a degree in history and classics. 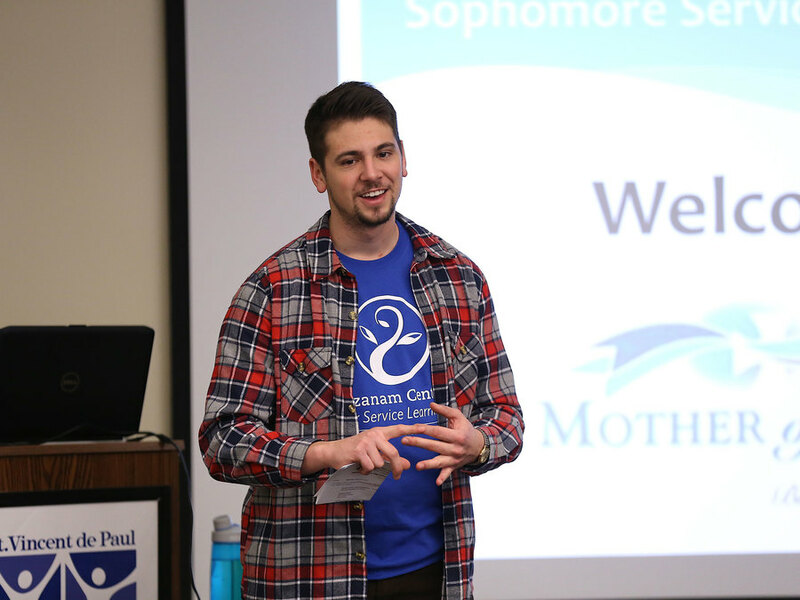 Delisio works as a service learning coordinator, where he helps lead service-learning retreats for high school and college students. He also helps organize visits with clients of St. Vincent de Paul at their homes and often takes part in those visits, too. Delisio, 22, like the other VVCs who were eligible, had to apply for the Supplemental Nutrition Assistance Program, or SNAP, more commonly known as food stamps. He had a particularly difficult time. Delisio said he was on hold for 30 minutes the first time he called to start his benefits before his phone got disconnected. He had to wait another 30 minutes when he called back. He didn’t actually start getting food stamps until early December. Family members have worried about his safety because of where he lives, Delisio said. “It all comes from a place of love, but there are definitely comments,” he said. Delisio said he has never felt afraid in the West End. And living and working among his neighbors in need has given him a new understanding and respect. Carmen Lopez Agredano grew up in southern Spain and applied to the VVC program after graduate school in Europe. Lopez Agredano, 26, had been involved in service work in various developing countries. This is her first time being in the United States, and it’s quite different from what she expected. Living in the West End has surprised Lopez Agredano, too, she said. Lopez Agredano works as a conference support coordinator at St. Vincent de Paul. She helps the different conferences throughout the region that make up Cincinnati’s Society of St. Vincent de Paul address the needs in their communities. She also translates when Spanish-speaking people come to St. Vincent de Paul’s Bank Street offices in the West End, although she doesn’t think of that as a special talent. “I don’t have a super power. I’m born in that country. I know the language,” she said. But Lopez Agredano said she has seen the relief in the faces of the Spanish-speaking people she has met. 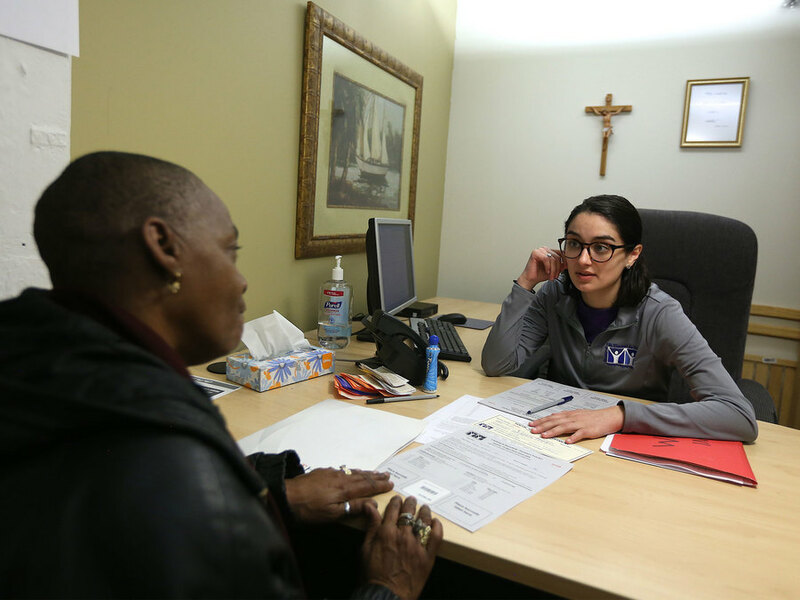 Like Delisio, she has been surprised by how difficult it can be for her fellow VVCs -- and St. Vincent de Paul’s clients -- to work through bureaucracy involved in getting food stamps. Her biggest lesson so far: The strength in the people that come to St. Vincent de Paul. Phyllis Kyei Mensah applied for the VVC program because she has always wanted to work in the nonprofit sector. She grew up in Ghana and got her master’s degree in political science from Miami University in Oxford. The experience has taught her a lot more about American society than college did, she said. That system is much different than what she expected after a lifetime of hearing about America’s big cities and celebrities. She has come to believe that people living in poverty here can be worse off than people living in poverty in Ghana, she said. 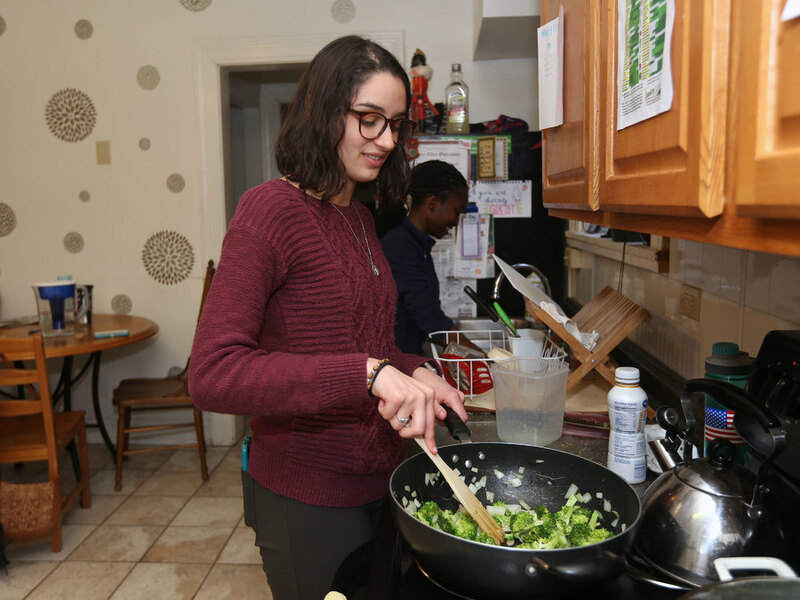 Living with such a diverse group of people has been a challenge for Kyei Mensah, she said. With VVCs from across the U.S. and three foreign countries, it can take work to build consensus and understand everyone’s perspectives. The Super Bowl is one example. The VVCs moved a television into a larger room of the old rectory so they could all watch the game together. They made snacks, and the Americans tried to explain why they all were rooting for the Philadelphia Eagles as the underdogs. Lopez Agredano and Kyei Mensah ended up being the only two in the group to root for New England because they felt like both teams should have fans. But in her day-to-day work at St. Vincent de Paul, language is the biggest challenge, she said. “The job I like the least is doing the intake forms because people don’t understand me, and I don’t understand people,” she said. Kyei Mensah’s job title is community relations associate. That entails working with people at St. Vincent de Paul’s Bank Street location and also going into neighborhoods sometimes. 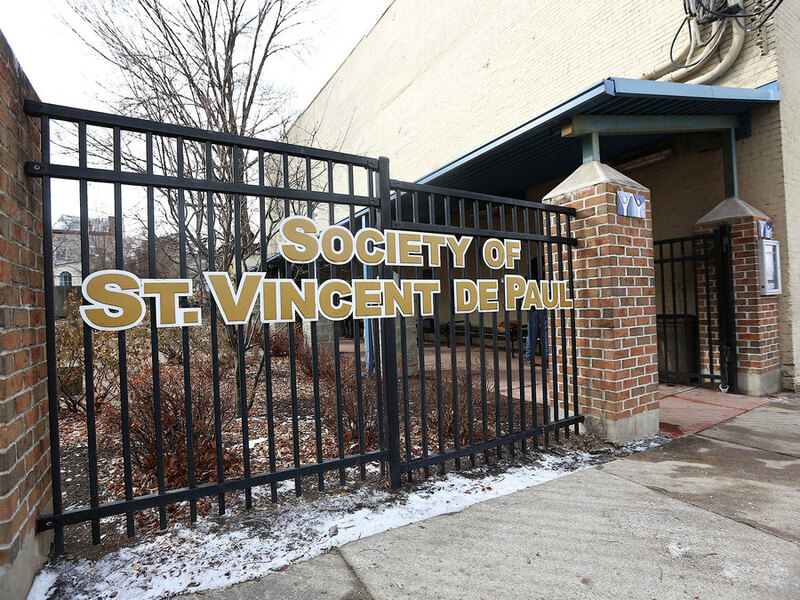 The work has left her wondering why the vast majority of St. Vincent de Paul’s clients are black or Hispanic. Ana Davila has known that service was her calling since she first got involved in the youth ministry at her church when she was 14. She grew up in Clifton Park, New York, near the Adirondack Mountains and graduated from Niagara University with a degree in developmental disabilities. 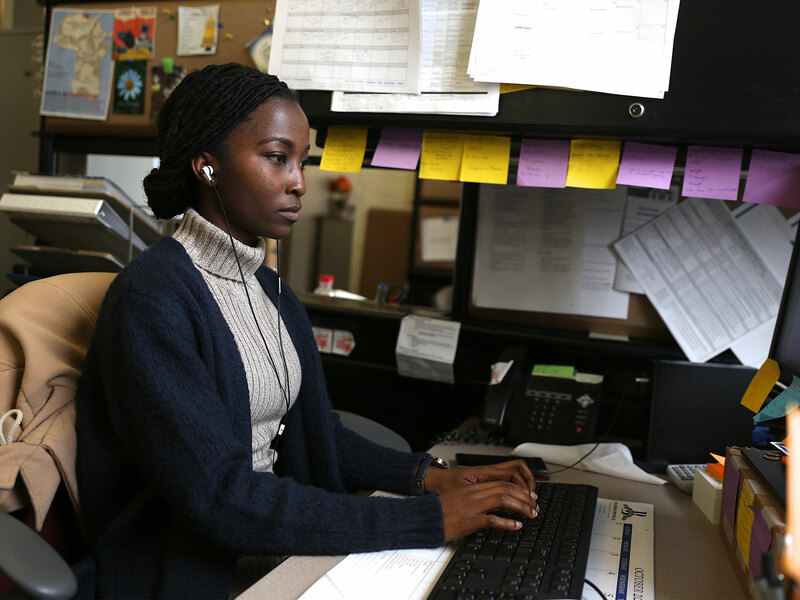 Davila, 23, works as a client advocate at St. Vincent de Paul, helping people get assistance ranging from food or new birth certificates to vouchers for furniture or other needs. A big part of the job, she said, is simply listening to people who are going through tough times. As rewarding as the work has been, though, life as a VVC has come with frustrations. Plus there is the hassle of not having a car and worrying about whether the group will have enough money on their food stamp cards to get through the month. The VVCs have a white board in the kitchen that shows exactly how much money is left on each card and the date each one gets refilled. Davila said she has begun to appreciate the far more urban neighborhood where she lives now as a VVC. Davila has become a regular at the YMCA in the West End, and there’s a group of men from the neighborhood who greet her like an old friend there. Davila has a way of talking to people like they’re old friends, too. On a recent morning, she and Lopez Agredano worked to add Cora Smoot’s grandsons to Smoot’s food pantry intake form so she could select more food for her family. Both young men had been shot, and their mother died late last year. They needed to move in with Smoot temporarily, she said, and she needed some extra help to keep everyone fed. Davila chatted with her and learned Smoot grew up in Erie, Pennsylvania, not far from where Davila went to college. “Dreary Erie,” Smoot said with a chuckle. For all the VVCs, though, the biggest challenge of their work has been the feeling that they can’t do enough. Kyei Mensah said she worries about the people and families that continue to need help from St. Vincent de Paul year after year. The solution to poverty, Kyei Mensah said, lies in better education and jobs, and it doesn’t make sense to her that growing up in a particular neighborhood should make it so difficult for people to get ahead. Lopez Agredano said she often feels like she should be doing more for the neighbors that St. Vincent de Paul serves. “It’s this feeling of, ‘I’m failing you,’” she said. That’s especially difficult for Delisio, he said, when he visits people in their homes. He described one woman he met who had lost everything. She had her belongings in storage but fell behind on the payments for the space so the company threw away everything. Those feelings of never being able to do enough can take their toll on those who spend their careers at social service agencies. Having a new group of young VVCs each year helps bring new energy to the work and keep the rest of the St. Vincent de Paul staff grounded in their mission and its importance. More information about St. Vincent de Paul or the Vincentian Volunteers of Cincinnati is available online. WCPO Digital Reporter Lucy May and Photojournalist Emily Maxwell are following this group of Volunteer Vincentians of Cincinnati throughout their experience. Childhood poverty has been an important focus for May and Maxwell and for WCPO. To read more stories about childhood poverty, go to www.wcpo.com/poverty .